The Brian Wilson myth lends itself easily to the biopic treatment—perhaps too easily. In clumsy hands, the Beach Boys co-founder could be reduced to his most infamous, sensationalistic qualities: genius! Recluse! Weirdo! Thankfully, the Wilson-approved Love & Mercy is several degrees smarter and more sensitive than that. It doesn’t entirely outrun the problems inherent to most biopics—especially those about tortured artists—but it’s agreeably audacious enough to do justice to a man whose life deserves better than genre conventions. The film is directed by Bill Pohlad, a producer or executive producer on The Tree of Life, 12 Years a Slave, Brokeback Mountain, Wild, and others. 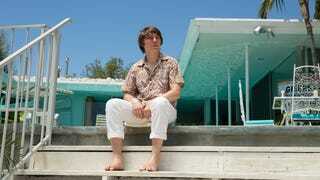 Here, along with screenwriters Oren Moverman and Michael Alan Lerner, he splits the Wilson saga into two perpetually crosscutting pieces: In the mid-’60s section, Brian (played by Paul Dano) is about to start work on Pet Sounds, the album that will cement the Beach Boys’ reputation. Then we jump ahead to the mid-’80s, where Brian (now played by John Cusack) has become heavily medicated and withdrawn, falling under the sway of manipulative therapist Eugene Landy (Paul Giamatti) before turning his life around thanks to a new love, Melinda Ledbetter (Elizabeth Banks). These two halves speak to each other, in a way: In the ‘60s, Brian is trying to overcome his doubting bandmates and father (Bill Camp) to make his masterpiece, while in the ‘80s, he’s battling to get out from under the thumb of Landy, who treats him like a child and dictates his medical treatment, leaving the fallen star feeling drugged up most of the time. Moverman co-wrote I’m Not There, the risk-taking 2007 portrait of Bob Dylan, but this movie isn’t nearly as experimental, sticking to a factual account of Wilson’s life rather than going off on impressionistic digressions. Still, Pohlad is ballsy to cast two different actors to play Wilson—especially when Dano looks a lot like the Beach Boy but Cusack doesn’t at all. Still, the strategy pays off. For one thing, Love & Mercy sidesteps the problem a lot of career-spanning biopics face when they’re forced to use makeup to make their stars look dramatically older or younger. For another, the actors’ different personae add new dimension to the character. Dano, whose baby-face features have masked degrees of darkness in films like There Will Be Blood and Little Miss Sunshine, captures Brian’s youthful enthusiasm while hinting at the mental demons lurking just around the corner. As for Cusack, he’s a beloved star who has drifted into an unfortunate middle age in which his once-youthful charm has melted away amid way too many forgettable cash-grab movies, which makes him a poignantly perfect choice to portray the fallen Wilson, and brings out one of the actor’s best recent performances, highlighting the shy, sweet man still there beneath Brian’s medication and helplessness. As intriguing as the chronological back-and-forth is, though, Love & Mercy’s temporal shift only distracts from the fact that, deep down, this is still a biopic. The ‘60s period shows us the creation of Pet Sounds and the development of Smile before Wilson began deteriorating; the ‘80s half focuses on the tentative love affair between Brian and Melinda (a former model reduced to working at a car dealership) and the battle to rid Brian of Landy’s evil influence. The margins are filled with precise performances that strip away the legends and emphasize the humanness of these people: Even Jake Abel, playing Mike Love at his ‘60s zenith/nadir, tries his best to make Brian’s Beach Boys nemesis more than just an easy boo-hiss villain. But Pohlad and his cohorts can’t quite escape a certain narrative inevitability: This is still the umpteenth film about a great artist who made his great work in the face of great obstacles, while also being the umpteenth film about how finding true love finally brought a troubled superstar his hard-earned happy ending. Love & Mercy doesn’t have a cynical bone in its body, and moment to moment, it’s an engaging film with plenty of great scenes. (Every shot of Dano in the studio working on Pet Sounds will make you want to pull out the album immediately: Lots of movies have shown musicians working on their greatest hits, but this one really captures the electricity of creative inspiration.) But the result isn’t as great at dramatizing Wilson’s mental problems, and its final love-conquers-all resolution feels a touch simplistic for such a complicated life. (And that’s to take nothing away from Banks, who’s quite good as a woman who, almost to her own surprise, falls for this odd, awkwardly charming man.) Nonetheless, where other biopics go for simple hagiography or just-the-facts highlight reels, this one at least cares enough to try to understand its central subject. Even when the film falls short, you can feel the love, and the mercy.